Officer Dan Tressler has been a member of the Shenango Township Police Department since May 2008. Canine Drago is a German Shepherd and joined the police force in August 2012. Drago was purchased from Shallow Creek Kennels. Shallow Creek Kennels imported Drago from Holland. Officer Tressler and Canine Officer Drago were trained by Master Trainer James �€�Pat�€� Moloney. Drago is dual-trained in patrol work (which includes building searches, area searches, tracking, article searches, aggression control and obedience) as well as narcotics detection. 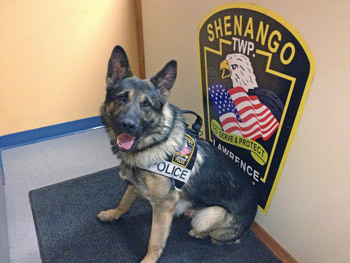 Together, Drago and Officer Tressler will work hard to protect and serve the citizens of Shenango Township.